Veteran French filmmaker Claude Chabrol takes on the story of magistrate Eva Joly’s ceaseless investigation into France’s leading oil company Elf Aquitaine. The inquiry led to a national scandal in 1994 which The Guardian newspaper described as ‘the biggest fraud inquiry in Europe since the Second World War . . . Elf became a private bank for executives who spent £200 million on political favours, mistresses, jewellery, fine art, villas and apartments’. 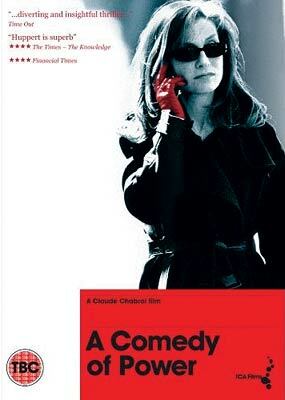 In her seventh collaboration with Chabrol, Isabelle Huppert takes on the role of Judge Jeanne Charmant Killman, assigned the job of investigating a high-profile case involving embezzlement at a giant state-supported company. Inevitably her investigation leads her to the upper echelons of government. Killman is given new and greater powers with each new discovery but her new-found influence and notoriety go to her head and private life begins to unravel as a result. Chabrol’s low-key exercise in portraying the intricacies of corporate legalese in an interesting and thrilling way is greatly helped by Huppert’s consummate, tightly-wound performance as a woman in the intoxicating grip of newfound power. Though difficult to follow at times there is no denying Chabrol and screenwriter Odile Barski’s commitment to laying bare the unbearable truths of France’s wealthy classes. Minimal extras.